Fire Sprinklers Vallejo, CA | A+ Waterworks, Inc.
Fire sprinklers in Vallejo, CA are everyone’s responsibility. Just as the devastation from a fire can spread like lightning, fire prevention can also spread, especially if everyone has fire safety measures or do their share. If each residential and commercial establishment in the city practices proper fire safety measures, the possibility of domestic fire would definitely decrease. By equipping homes and business establishments with fire sprinklers, Vallejo, CA residents can help lessen the number of fires that occur in their area. When buying fire sprinkler systems, Vallejo, California homeowners and business owners should only purchase from a reputable provider such as A+ Waterworks. A+ Waterworks provides the installation and repair of fire sprinklers in Vallejo, CA. We are proud to say that we have one of the most durable and reliable fire sprinklers in Vallejo, California and beyond. With us, you can expect professionally designed and serviced fire sprinklers in Vallejo, California at reasonable prices. Our comprehensive installation service and repair solutions for fire sprinklers in Vallejo, California are available to clients. We can install fire sprinkler systems in Vallejo, CA warehouse facilities, multifamily housings, hotels, office buildings, and more. With just a simple call, we can make your home or business establishment safer! More often than not, fires lead to large-scale devastation. Thousands of homes have burned down due to the lack of proper fire prevention devices in homes, such as fire sprinklers. Vallejo, CA residents can protect themselves by installing fire sprinklers. Vallejo, CA communities will surely benefit from these fire safety methods since they prevent domestic fires in the area. By installing fire sprinkler systems, Vallejo, CA residents can protect those that matter to them the most. Homeowners should install fire sprinklers in Vallejo, CA to ensure that they and their loved ones have basic protection against domestic fire. Similarly, business owners can protect and increase safety within their source of income by arming their commercial establishments with fire sprinklers. Vallejo, California community members work hard to achieve protection to reach their personal and business goals. Installing fire sprinkler systems in Vallejo, California is simply one of the ways they protect their hard-earned investments. According to the NFPA, by installing fire sprinkler systems, Vallejo, CA residents significantly increase their chance of survival during a fire. In fact, fire sprinkler systems in Vallejo, California are one of the most effective fire-prevention tools residents can use. This is because they activate extremely fast, allowing them to control the fire immediately. Should You Have Fire Sprinklers in Vallejo, CA Installed? If you have a home, business, or family, then the answer is: yes, you should get fire sprinklers in Vallejo, CA. They’re one of the quickest, easiest, and most affordable fire prevention methods available. However, make sure that you only work with established professionals such as A+ Waterworks. When it comes to high-quality fire sprinkler systems, Vallejo, CA community can depend on us! Aside from fire sprinklers, Vallejo, CA residents may also turn to us for top-notch plumbing and sanitation services. You may call us at 707-558-022 or leave us a message on the inquiry form located at the bottom of our contact page. 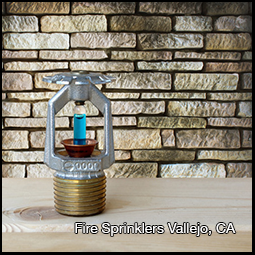 You can also visit our website for more information on our fire sprinklers in Vallejo, CA and how our products can help protect your family and property!